They are almost gone now. Borders stores will soon be just a memory. So I’ve begun going down Borders-memory lane. I didn’t always need to buy a lot of books at Borders (or anywhere else), since I get plenty of review copies. But somehow my wife Hillary and I always ended up spending a lot of cash there, making liberal use of that discount card. 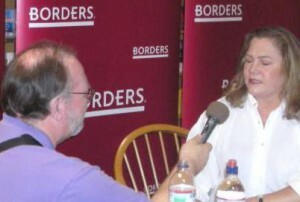 In recent years Borders stores were also frequently venues for Eye on Books interviews. I will always be grateful to the managers who, even while in the midst of preparing for an author and their entourage, always so kindly accomodated me by finding a quiet place (often the manager’s own office) for my interview. At Borders in Bailey’s Crossroads, Virginia, for example, April Lilley was unfailingly generous. April’s store was kind of Borders’ “flagship” in the D.C. area, the one with the biggest marquee names – Vince Flynn, Linda Fairstein, Barbara Delinsky, Rita Mae Brown, Robert Crais, Steve Martini, and Jodi Picoult, among many others. Borders on Wisconsin Avenue in D.C. was a store I visited often, because it’s close to my “day job.” I would often, with the generous help of manager Dan Broeker, meet authors in the cafe. That’s why you’ll hear clanking dishes and coffee-making sounds in the background of some of my interviews – Mark Danielewski, Larry Doyle, Eric Jerome Dickey, Philip Margolin, and Junot Diaz, among others. – Borders at White Flint Mall in Rockville, Maryland. That’s where I interviewed Danica McKellar, and hit a deer on Route 29 on my way home that evening. – Borders in Columbia, Maryland is where I met Jeffrey Buckner Ford, son of ’50s singing star Tennessee Ernie Ford. He and Hillary and I all went to dinner afterward. – Michael Oher was among a few authors I interviewed at Borders in Lutherville, Maryland, outside Baltimore. The Saturday afternoon in February that I was there the place was packed so tight I feared an order from the fire marshal. To make matters worse, not nearly enough of Oher’s books had arrived and the staff was left scrambling. - Me: “Hi, my name is Bill Thompson…” Kathleen Turner, sounding just like Tallulah Bankhead: “Hello, Bill Thompson.” My short interview with Turner at Borders in downtown D.C. was perhaps the only time I have ever just shown up at an author event, without an appointment, in hopes of getting an interview. (She was exceedingly gracious, too, by the way.) That store, at 18th & L Streets, is also where I interviewed El Presidente Vicente Fox (with an appointment, thank you), Dave Barry, and Sarah Silverman. And then there is one more Borders memory I have that has nothing to do with books. I had just met Hillary in 1997. We had been dating for, perhaps, a week when we decided to meet at Borders at White Flint Mall in Rockville for coffee. I also selected a scone, but being scone-challenged, I found it pretty dry and difficult to chew. Apparently I somehow made a funny face while trying to negotiate that scone, and — Hillary has told me many times — that was one of the things that made her fall in love with me. We were married two years later. Borders, I will miss you. Me again. I forgot to add that I worked at the White Flint Mall store for 12 years. Your mention of the scone scene in our cafe made me laugh and tear up at the same time.